Are you ready to have the ultimate winter experience in Alaska? 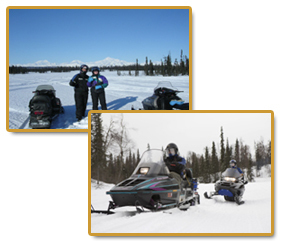 Snowmobiling is one of the easiest and most enjoyable winter recreational activities that Alaska has to offer. 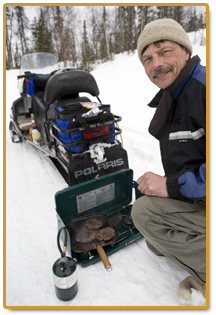 Our trails are varied so our guests have plenty of options depending on trail conditions and individual experience. For those folks that love to ski and snow shoe or would like to have their first experience with these activities, this is the place to come!!!! 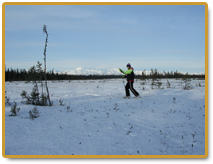 Our trails are mostly flat or easy rolling hills…great for beginners or experienced skiers! Our Inn is a great place for a group retreat! There is a trail right out the back yard of the Inn! You can go for miles on groomed trail or you can forge on through untracked snow! We have maps available of all the trail systems in this area. We have snow shoes that you can borrow at no cost. We don’t have ski gear for rent so you’ll need to bring your own. We make recommendations as to where you can obtain them. 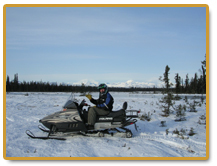 Come enjoy the “TRUE ALASKA” with us! We have ample parking for ATV or snow-machine trailers. *Ski tours must be booked in advance.